The Title "Keep Smiling Through " is written by Ellie Dean. This book was published in the year 2012. The ISBN number 0099574624|9780099574620 is assigned to the Paperback version of this title. This book has total of pp. 512 (Pages). The publisher of this title is Random House. We have about 69864 other great books from this publisher. 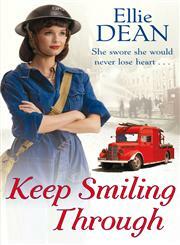 Keep Smiling Through is currently Available with us. June 1940. Despite losing her mother at A Young age and her father away on important war work, seventeen-year-old Rita Smith has plenty of people to turn to in the close-knit community of Cliffhaven. Until Italy sides with Germany and Rita's closest friends and neighbours are interned as enemies of the state. Ellie Dean lives in Eastbourne, which has been her home for many years and where she raised her three children. She is also the author of THERE'LL BE BLUE SKIES and FAR FROM HOME.